Based on the Lucrehulk Transport, these modified freighters provided the bulk of the power of the CIS during its formative stages. 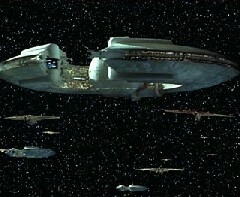 The TF Battleship provides enormous transport capacity, functioning as a mobile base supporting hundreds of Vulture Fighters, C9979 Landing craft, and entire legions of droid soldiers. However, these behomoths were never initially designed for this duty, and despite copious armor and shield generators the numerous secondary power reactors installed proved to be quite vulnerable to enemy fire. The TF Battleship can control 16 flights of fighters, plus one legion of droids on the ground. Secondary Reactors can create cascade reactions, see rules.